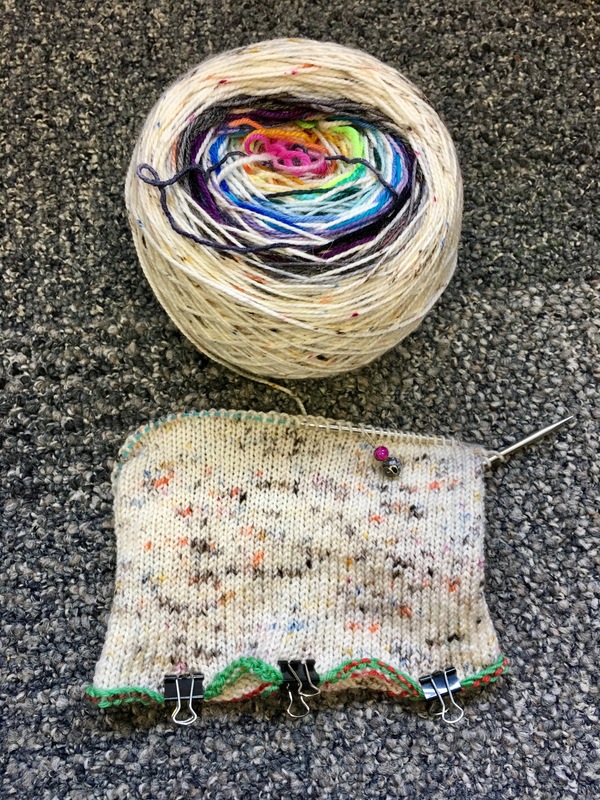 You guys…..a Netflix binge and a Jellybean play date has me ALMOST done with my Daunt Cowl! I finished up the oranges, reds and pinks. I had 7 colors left not the 4-5 I had guessed. But I powered through! Now I need to Kitchener in the round for the first time…..wish me luck…..
My Daunt Cowl feels like it’s really picking up steam!! Last I posted I was finishing the purples. Well, over the Christmas holiday weekend I plowed through the blues and greens. And then before New Years I worked through yellows. I am finding the shrinking yarn ball more of a motivation than the stripes. Which I think is a weird twist to this project. Usually it’s the color change that pulls at me. I only have 4-5 colors left and I really want this cowl to be finished! Boy howdy is it cold here in Kansas! My Daunt Cowl has been growing slowly oh low these past few weeks of potty training. I’m just now starting the last of the purples! I’m still not sure I’m sold on the magic knots as I can tell where they are in my work. They are thus far staying on the back side of the work. But full disclose, I have not blocked this and blocking is ALWAYS magic. I do find myself rushing in order to get past the purples because up next is BLUE! My Daunt Cowl has some seen some action! I managed to plow throw the rows and rows of speckled solid color. I could not wait to start getting to the color changes! I’ve now completed the three grey and black stripes. Next up is the purples in my rainbow of scraps. I just love looking at the rainbow cake unwind as I knit. It’s just so pretty!! My Daunt Cowl has seen some action this week. I had a two hour HIPAA training at work that was all slide show/webinar. I knew I needed something to stay awake so I knit quietly under the table and managed to rack up several inches of stockinette. I’m still in the solid main color section and that’s okay. But I can’t wait to get to the colors! I also pressed a few small binder clips into service to keep my project from curling so I could observe actual knitting project. I know in my head that it grows with every row but it’s nice when my eyes can back up that logic, lol.